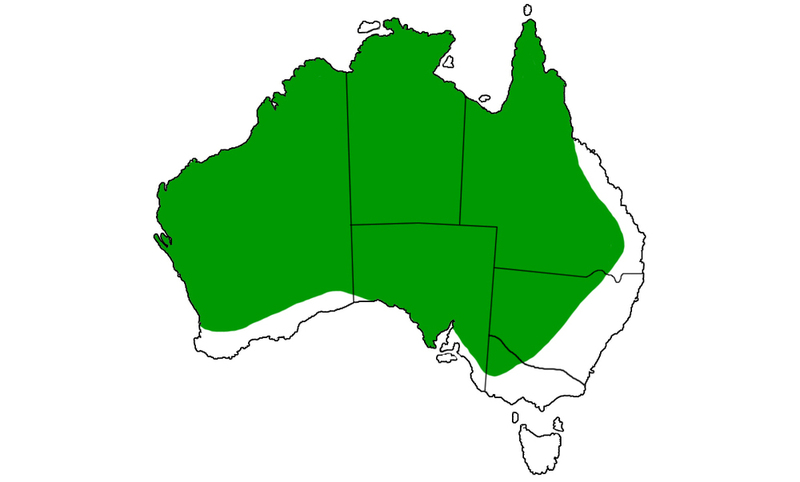 Western brown snake can be found over most of mainland Australia, being noticeably absent from the moister areas of the east, south east and south western Australia. Western Brown Snake shelter in disused mammal burrows and deep soil cracks, and under fallen timber and rocks. During warmer weather these snakes become nocturnal. They feed on small mammals, birds and reptiles, including other snakes. Western Brown Snake species includes 12 to 16 colour variations, some of which may turn out to be different species. The phylogenetic relationships of the brown snake group are still being investigated. It may turn out that this black-headed form of the western brown snake is actually a separate species. 9 to 38 eggs are laid in a clutch from November to January. Once the babies hatch they are completely self-sufficient, and are capable of delivering a dangerously venomous bite to humans. During warmer weather Western Brown Snake become nocturnal. Western Brown Snake includes 12 to 16 colour variations, some of which may turn out to be different species. The phylogenetic relationships of the brown snake group are still being investigated. It may turn out that this blackheaded form of the western brown snake is actually a separate species. 9 to 38 eggs are laid in a clutch from November to January. Once the babies hatch they capable of delivering a dangerously venomous bite to humans. Western Brown Snake feed on small mammals, birds and reptiles, including other snakes.